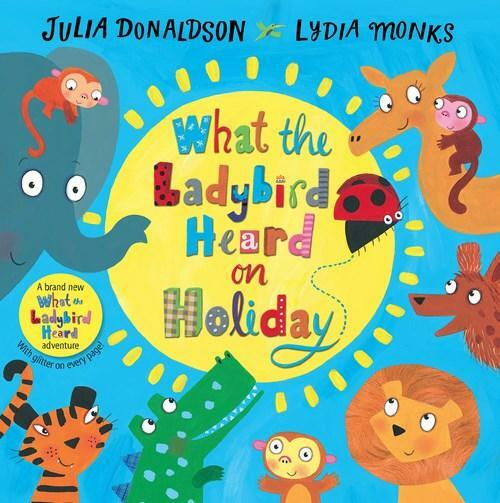 What the What the Ladybird Heard on Holiday is a new story in the series, What the Ladybird Heard, by Julia Donaldson, popular children's author of Room on the Broom, Zog, Cave Baby and more recently The Giant Jumperee. What will the ladybird hear in this story? Will the robbers Hefty Hugh and Lanky Len be back with a new plan to steal something? While on holiday, the ladybird visits the zoo and comes across the bad men, Hefty Hugh and Lanky Len, with a plan to steal once again. This time the men plan to kidnap Monkey Joe from the zoo, to assist them in stealing the Queens crown. But the ladybird heard and told the zoo animals. She comes up with an idea how to stop the robbers and tells Monkey Joe. Then she flies to the palace to tell the corgis, Willow and Holly, what she heard. Will they be able to foil the robbers once again? Julia's recipe for a good read aloud story, is executed once again using rhyme, adjectives, onomatopoeia and repetition. Lydia Monks' illustrations using colour and collage are delightful. The children will enjoy finding the tiny ladybird. I particularly liked how Lydia illustrated the zoo at night, with a multitude of eye balls open on a mostly black page. I think that if you like ladybirds and stories by Julia Donaldson you will enjoy this action packed story where the ladybird and her friends are triumphant against the robbers. To find out more about Lydia Monks see her answers to the Kids' Book Review's 12 Curly Questions here.